Preeminent Preamps The XENYX 1002B represents a significant milestone in the development of mixer technology. Equipped with our premium XENYX mic preamps, it can easily hold its own against the most expensive stand-alone mic preamps, both in terms of sound quality and available headroom. XENYX preamps offer a staggering 130 dB of dynamic range, with a bandwidth that extends from below 10 Hz to well above 200 kHz. XENYX mic pres provide such transparent, crystal-clear performance you just might think someone upgraded your mics. State-of-the-Art Goes Portable Whether you plug it into the wall or power it via 9V batteries,including XENYX mic preamps for amazing sound quality, phantom power for use with professional-grade condenser mics, 2-Track inputs and outputs, and 60 mm faders. The four stereo channels accept left/right or mono 1/4" TRS/TR inputs, and three of them also accommodate microphones (with separate Trim controls). The compact XENYX 1002B mixer also features our highly musical 3-band British EQ, plus an FX and monitor send for each channel, making it a must-have for any audio toolkit. Sublimely musical British EQ The British consoles of the 1960s and '70s changed the sound of rock and roll-without them the British Invasion might not have happened. Those legendary mixing desks soon became the envy of engineers and producers all over the world. The 3-band EQ on the XENYX 1002B mixer is based on that very same circuitry, allowing you to imbue signals with incredible warmth and detailed musical character. and superb audio quality. Bundle Includes 2-Strukture SMC20 20' XLR Microphone Cable We selected the top-selling cables in the industry and eliminated as much packaging cost as possible without sacrificing quality. 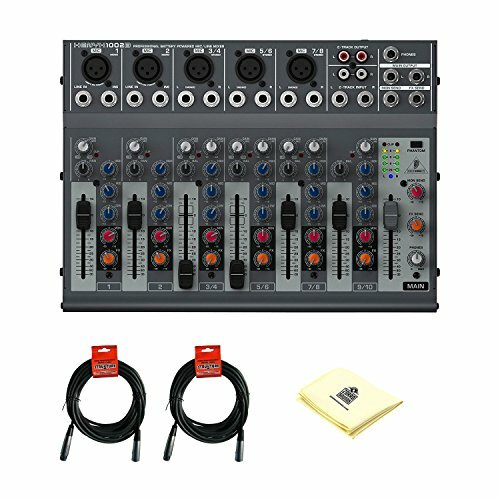 Save With This Bundle-Behringer Xenyx 1002B 3-band EQ, Battery-powered Capability Premium 10-Input 2-Bus Audio Mixer - Singers who perform with backing tracks, as well as instrumentalist/singers (acoustic guitar or piano bar, for example) find the XENYX 1002B indispensable for patching into "house" systems. Field Operation Its compact size and flexible input scheme also make it the natural choice of sports announcers for calling play-by-play game action. If you have any questions about this product by Behringer, contact us by completing and submitting the form below. If you are looking for a specif part number, please include it with your message.